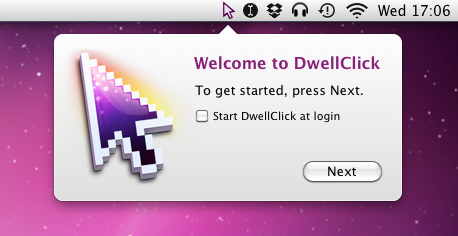 DwellClick is an application for Mac OS X which clicks and drags the mouse for you. DwellClick relieves the body from the repetitive physical effort of clicking, and can help prevent injures. It is also useful for people with a disability which makes physically clicking the mouse difficult or impossible. For downloading and installing DwellClick, see the installation instructions. First time user? Try the Tutorial. How can I make DwellClick better for you? Email your questions, ideas and complaints to support@pilotmoon.com, tweet @pilotmoon, or use the bright blue Feedback & Support tab on this page.